Former Speaker of the House Newt Gingrich said Wednesday on Fox News the shooting in Alexandria was "part of a pattern" reflecting the "increasing intensity of hostility on the left." Bernie Sanders supporter James T. Hodgkinson, 66, shot five people, including House Majority Whip Steve Scalise, as they were practicing for an upcoming annual Congressional Baseball Game. "Look, I talk to college students regularly who say that if they are openly for Trump, they get threatened," Gingrich said. "I've had college students tell me they get threatened with being beaten up, some of them get death threats." "The intensity is very real, whether it's a so-called comedian holding up the president's head covered in blood, or right here in New York City, a play that shows the president being assassinated, or it's Democratic leading national politicians, who are so angry they have to use vulgarity, because they can't find any common language to talk," he said. Melissa Francis countered: "Sir, with respect though, I mean, even if everything you're saying is true, to talk about it in those kind of terms, of left and right right now in the wake of it, does that make sense? Does it make it worse?" "Do you want to know the truth?" Gingrich responded. "Well... but do you rise above it and say we all need to stay calm and focus on the work ahead of us?" Francis said. "No," Gingrich interjected half-way through, responding to her question of whether to "rise above it." 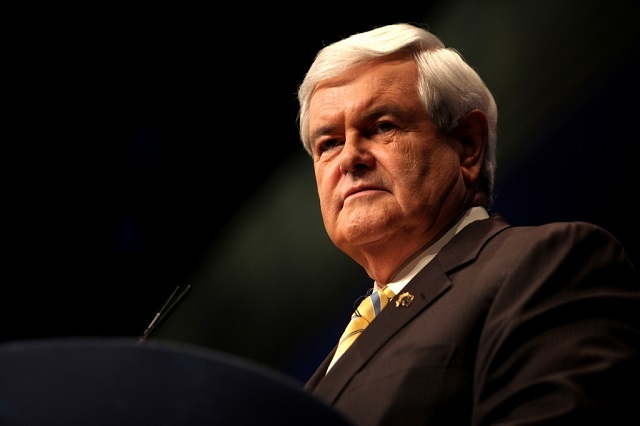 "You've had a series of things which send signals to tell people that it's okay to hate Trump, it's okay to think of Trump in violent terms, it's okay to consider assassinating Trump, and then suddenly we're supposed to rise above it," Gingrich said. "Until the next time?"